Nicholas Welch is not your typical 13-year-old boy. Until 3 months ago, he would have said he was just a normal kid, but on July 26th, 2016, his life took a turn. It was on that day, after 6 hours in the ER, he learned he would be going to Children’s of Alabama via an ambulance. He has been in Birmingham ever since. Nicholas’ left and right valves of his heart are enlarged and he suffers from congestive heart failure. Since candidates for heart transplants must fit certain criteria regarding their BMI, he was not immediately placed on the heart transplant list. So he got to work, lost 80 pounds, and was placed on the transplant list on October 10th. Now, his days are not filled with school and hanging out with friends. 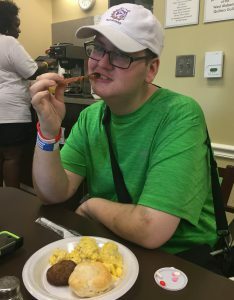 Instead, he spends his days in Birmingham at the Ronald McDonald House waiting for a new heart. Take a look into a typical day and see for yourself. Nicholas and his mom, Teresa, walk a block away from “home” to Children’s of Alabama for his morning clinics. A team of nurses and doctors check everything from his blood work, to an EKG and even X-rays to ensure Nicholas is getting the best treatment. Breakfast at the Ronald McDonald House. Some days his breakfast is something his mom prepares, some days (like today), it is provided by volunteers. Wal-Mart’s Health and Wellness group provided breakfast this morning. It’s back to Children’s of Alabama for physical therapy. 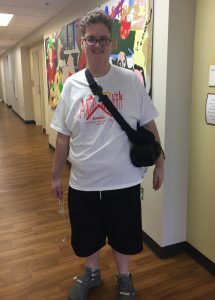 Nicholas is working on his strength — upper and lower body to make sure his body is ready for a new heart. He has to carry a bag with him everywhere he goes. It contains batteries and a controller for the LVAD, left ventricular assist device, he had implanted in his heart in early September. A short rest back in their room after a busy morning. Nicholas and his mom head back to Children’s for his appointment with a cardio specialist. Once Nick was officially placed on the transplant list, certain procedures must be followed. School work in the Family Room at RMHCA. Nicholas gets his work from his school at home, Ranburne High School. He is doing everything he can to make sure he stays on track during his 8th-grade school year. 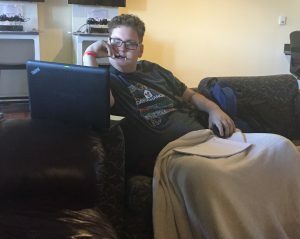 Some days he works with Ms. Tara at the Sunshine School at Children’s of Alabama, but today he’s just doing his homework at the House. He told us his favorite subject is English, but no subject is fun when you are far from friends. 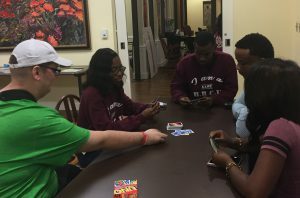 A fun activity night with Alabama A&M students takes place in the Ronald McDonald House conference room – board games, Twister, coloring and more! While Nicholas feels too old for many of the activities at RMHCA, he and his mom make the most of it. They enjoy getting to know other families and making new friends. Nick enjoyed playing Connect 4 and Uno tonight. Dinner from the Peter’s Family. This is one of Nicholas’ favorite meals. The Peters serve dinner once a month and always prepare amazing home cooked meals. October’s meal: Tossed salad, roast pork with gravy, homemade mac and cheese, fresh veggies and rolls. After dinner, it’s time to relax and enjoy some TV. Some nights they watch in the Family Room with other guests at the House and some nights they enjoy TV in the privacy of their own room. Time for his nightly medicine. Nicholas takes a handful of pills each night before bed. Bedtime after a busy day. While every day is not the same, Nicholas and his mom have created a routine here at the Ronald McDonald House. Some days, they have friends and family visit, some days they have more doctor visits than others, but each day is another day waiting for a heart. While Nicholas is on the transplant list, he must stay within one hour of the hospital at all times. This means he cannot go home, which makes for a very long wait. The nurses have told him he’s had a couple of “pings” (potential donors) so far, but until a perfect match is found, Nicholas is still waiting. 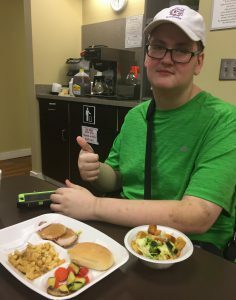 Once Nick does have the heart transplant surgery, he will have to stay close to the hospital for a few months afterward to confirm all is going according to plan. Stories like these make it perfectly clear why the Ronald McDonald House is so critical to so many families. Thank you for your help in making our services available to those in need.